Last year we bought second hand Tamiya M01 and M02 cars. Both cars were in excellent condition. However, on both car the plate that secures the battery was missing. The plate is a very simple piece. The same plate design is used left and right. 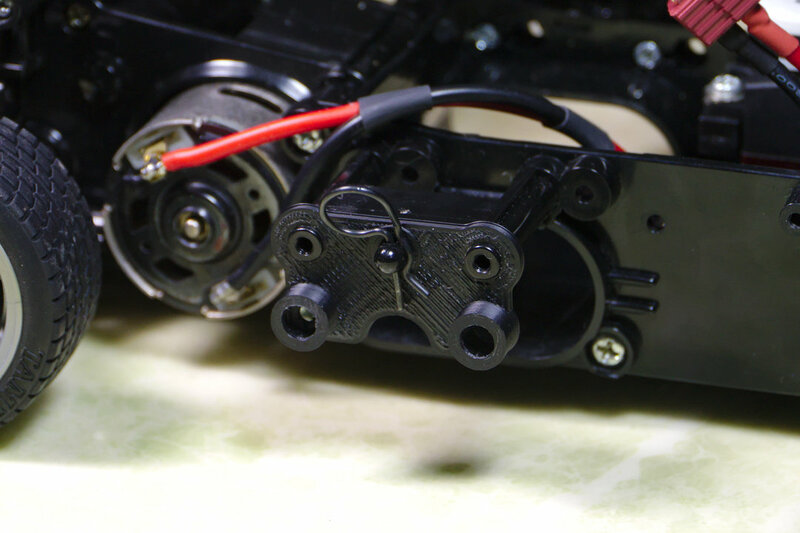 On the right side the plate is screwed down, while on the left side it is secured with a large body clip so that the battery can be changed quickly. Spare parts for the M01 and M02 are already very rare. On eBay you can find the odd sprue for sale; for ridiculous prices. Instead of parting with a lot of money, we made replacement plates from a scrap piece of plastic. It worked, and it looked alright. But now we got a 3D printer, so we can do better. The shape was very easy to reconstruct. We used OpenSCAD, which is software for creating solid 3D CAD models. It is something like a 3D-compiler that reads in a script file that describes the object and renders the 3D model from this script file. This is very similar to software development, so we felt right at home. The battery end plate is made from cubes and cylinders. We used calipers to measure the original plate and used the data in our OpenSCAD model. 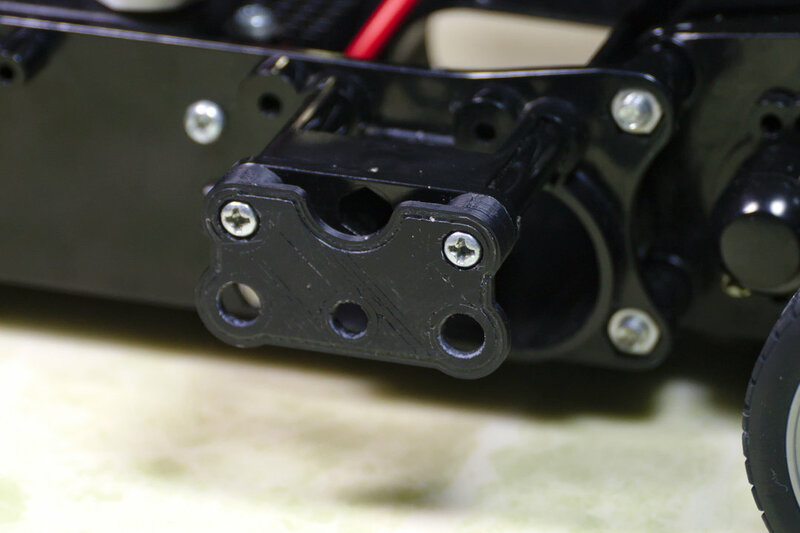 We printed the part in black ABS. Printing two parts in the "fine" quality setting of our printer took 28 minutes. We had to clean-up the holes a bit but for the rest the parts fit perfectly. 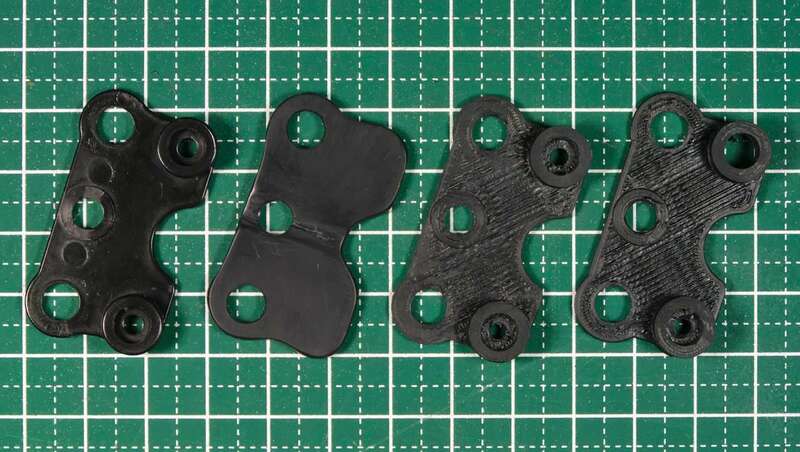 Due to the surface structure created by the 3D printing process, the part does not look 100% original. But it is better than the handmade piece we used earlier. In case you want to make your own, we made the design available for download at Thingiverse. have a fun RC car restoration!